Viloria vs. Segura (Fight Results and Video Replay) vs Romero! UPDATE: Brian Viloria defeated Giovani Segura via TKO (referee stoppage) in the 8th Round. Congratulations to Brian "The Hawaiian Punch" Viloria for retaining his belt and won against the Mexican Great Giovani Segura! For the Philippine TV broadcast, GMA 7 Kapuso Network will show the fight at 10 AM on Sunday December 11, 2011 Philippine local time. You can watch that on live through internet free streaming on the said date and time (Philippine local time and date) copy or click @ http://pinoy-thinking.blogspot.com/2011/05/gma-7-live-streaming-pinoy-tv-watch.html . Martin Honorio defeated Fahsai Sakkraeerin in co-evening's feature via split decision. Ardin Diale defeated ex-undefeated prospect Lolito Sonsona via unanimous decision. Here comes another exciting battle between Brian Viloria and Giovani Segura for WBO Flyweight Championship Match. 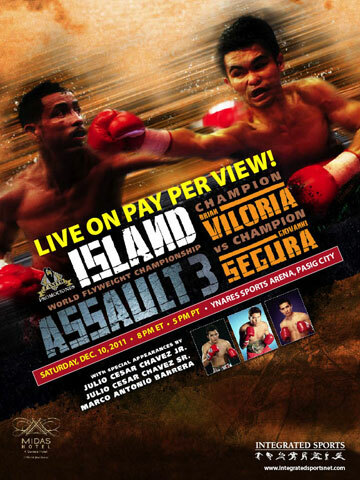 Integrated Sports Media, announced that it will distribute the Saturday night “Island Assault 3,” featuring the World Boxing Organization (“WBO”) Flyweight Championship between defending champion Brian “Hawaiian Punch” Viloria and challenger Giovani “El Guerrero Azteca” Segura, live from Ynares Sports Arena in Pasig City, Metro Manila, Philippines. “Island Assault 3,” presented by Zanfer Promotions and Saved by the Bell Promotions, is being distributed in the United States by Integrated Sports Media for live viewing at 8:00 PM/ET – 11:00 PM/PT on satellite pay-per-view via DISH Network , for a suggested retail price of only $29.95. Availability via on-line PPV will be announced shortly. Will Viloria be able to defend his crown? Or will Segura be able to succeed Viloria's belt? We'll find out who will gonna stand the battle for Viloria vs Segura fight!